This year, we are celebrating the 15th anniversary of our foundation. Our society was founded on 18th of July 1988 at the Abbey of Hauterive near Fribourg, Switzerland and was canonically erected by the Holy See on 18th October 1988. This year, we have moved our International Headquarters from Wigratzbad, where it was with the seminary, to Fribourg in Switzerland. Our new headquarters was bought in 1999 and was used as a house of studies for those members of the Fraternity who were studying at the University of Fribourg. The French section of the Faculty of Theology at Fribourg is quite good. A number of orthodox and thomistic Dominicans are still teaching there; unfortunately the German section of the same faculty is not as good. The move of the General House is necessary for a more efficient organisation. We now have about 150 priests world-wide, we are working in four continents, and in about 15 countries. It is quite a challenge to supervise such a wide body of people with different backgrounds and mentalities. Not everyone has been educated in our first seminary at Wigratzbad; more and more priests have been trained in our house of formation in America. A few priests who are helping me govern the Fraternity live with me at the General House. First, the Vicar General, Fr. Patrick du Faÿ, one of my assistants. 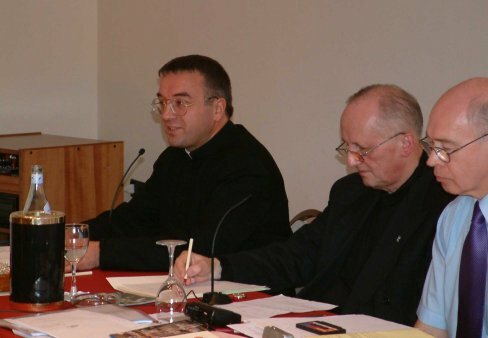 The Secretary General, Father Philip Creurer, having been appointed rector of the seminary in Wigratzbad, I must find someone else to replace him. The Bursar General, Fr. René de Reboul, will also relocate to Fribourg. Another priest, Fr. Marc-Antoine Dor, a graduate from the famous school “Ecole des Chartes” - which specialises in studying manuscripts in old French and Latin, is our archivist. Our archives are in need of a great deal of work! You may ask yourself why we chose to relocate our General House to Fribourg. First, as I said, we were founded near Fribourg. Our first choice was to relocate to Rome since we are a society of pontifical right. Unfortunately, we do not have a house in Rome and we do not have the financial means to buy one now or in the near future. With the recent construction of our two seminaries, the one in Wigratzbad, Germany and the other one in Lincoln, Nebraska, our finances are quite strained. We are also in the process of buying the property we have used as our District House in America for ten years. The diocese had given us its use with the understanding that when we would be able to purchase it, we would do so. I have a good news to announce, one we have not advertised much so far and which you might hear for the first time today: Our constitutions have been approved by the Holy See in a definitive manner on the 29th June 2003. This is the text which had been revised by the 2,000 Chapter General. One of the significant changes is the introduction of provinces. A superior of a province, a provincial, is a major superior. So far only the Superior General and his vicar are major superiors. A major superior is an ordinary. For priest members of a society of apostolic life (a sort of religious order), the major superior is the equivalent of a bishop for diocesan priests. It might take a few years before provinces are introduced since our constitution specifies that provinces can be introduced only by the Chapter General. So, we will have to wait until the next Chapter General for that. This approval of our constitutions is a good reason to rejoice. Fifteen years is a rather short time for a definitive approbation of the constitutions. Usually, it takes many more years. Since I last spoke to you two years ago the Fraternity has grown rapidly. The most spectacular growth has been in our District of France. Since 2,001 we have been welcomed into eight more dioceses: Valence (Montélimar), Toulon, Le Havre, Angers, Bordeaux, Créteil, and this year Dax and Sées. The diocese of Dax is near the Basque country and the Spanish border. This is quite an interesting story. For many years, a parish priest had kept saying the Mass of his ordination in his parish. He was getting old and the question of his succession arose. A new bishop was appointed in the diocese and we approached him proposing him a priest to continue this ministry. Fortunately he was more open than his predecessor was. Fr. Vincent Ribbeton began helping the old pastor while he was carrying studies in Toulouse and then last August went to the small village of Clermont, in the surroundings of Dax, to become chaplain of this Latin Mass community numbering around 250 souls. He is also taking care of a small school that the former parish priest had started. The elderly parish priest has now retired and has become the chaplain for a community of nuns. We have also been invited into the diocese of Sées in Normandy. You probably never heard of that name! The main city in the diocese is Alençon, the city where St. Therese of Lisieux was born. The Fraternity has now a priest who takes care of the Latin Mass community of the diocese. He actually says Mass in the chapel of the former diocesan major seminary. The same priest is also chaplain of a private school, La Croix des Vents, which purchased the former seminary. Why such a growth in France? First of all, there has been a number of new bishops who are more open than their predecessors regarding the Latin Mass in general and the Fraternity in particular. The French District Superior, Fr. Xavier Garban, and myself have also tried to visit as many bishops as we could to introduce them to the Fraternity. There are also quite a few French priests who are members of the Fraternity. They number around fifty and make up about one third of the Fraternity. Regarding our growth in the English-speaking world, our biggest limitation is our (currently) limited number of priests whose mother tongue is English. For this reason, our growth has been somewhat limited. However, the good news is that our English speaking House of Formation, Our Lady of Guadalupe Seminary in Lincoln, Nebraska, is overflowing with about 70 seminarians currently in training. We are looking forward to building a second dormitory wing as some of our seminarians have to share rooms at the moment. Since 2,000, we have been expanding in America only at the rate of one new diocese per year; in 2,001 it was the diocese of Colorado Springs, then in 2,002 it was the diocese of Boise, Idaho, and in 2,003 it is the diocese of Tyler, Texas. There is a small town in Northern Idaho called Post Falls; it is actually a suburb of Spokane, Washington. Thanks to the pastor of the local parish, an Indult Mass had begun in the parish church but the elderly priest who was saying the Mass could not do it any longer and the pastor had too many other duties. I had approached the bishop back in 2,000 but he was reticent to invite an order of priests that offered Mass solely according to the old Missal. I wrote a letter to the bishop using the document of the Holy See Mutuale Relationes of 1974. Bishops must respect the specificity of religious orders which were founded and approved for a specific task. The Fraternity of St. Peter’s specificity is, above all, liturgical and this is perhaps a novelty. At any rate, our priests work at the invitation of bishops primarily for a specific task: to serve those faithful of their diocese who wish to avail themselves of the dispositions of the motu proprio Ecclesia Dei. Our priests can help in other ways but it has to conform to our specificity. Because we presented ourselves in a positive manner with a specific charism, the bishop finally decided to invite us. We have had a priest there now for about a year and everything is going fairly well. There are now two Latin Masses on Sunday as the church became too small for the congregation. Our priest also helps with hospital ministry. This year we were invited into the rather large diocese of Tyler (most of North-east Texas). The bishop of that diocese, who came from Puerto Rico, decided, when he was appointed, that he would establish three or four centres for the traditional Mass in the various parts of the diocese. He was not able to do so as he couldn’t find enough priests willing and able to do so. So, he asked the Fraternity over a year ago to send a priest but we had none available at the time. Just last September, we were able to send one of our priests, originally from Texas. He is now assigned in Tyler in view of eventually creating a personal parish. There has been growth in Australia as well but we have also been limited by a lack of English-speaking priests. In 2,000, Archbishop Pell, then Archbishop of Melbourne, invited the Fraternity into his diocese. In 2,001, we were able to expand into the archdiocese of Sydney with the house being actually in the diocese of Parramatta, a suburb of Sydney. In 2,002, we began working on a regular basis in Parramatta as well. Earlier this year we started to serve the city of Canberra where our priest is not only the chaplain for the Latin Mass but also for a local hospital. There are good prospects in two more archdioceses. We now come to our German-speaking district, as we call it, which includes German-speaking Switzerland, Austria and Germany. There has not been much growth except in Switzerland where we have been given more apostolates in the diocese of Chur-Zurich. Since July 2,003, the district has a new District Superior, Fr. Axel Maussen. The seat of the district has varied several times in the past. The most central for that district is actually Wigratzbad. Since the General House is no longer in Wigratzbad, it is now possible for the district to relocate there. A house has been purchased in Wigratzbad so the district can organise itself independently from the seminary in a more efficient manner. We are currently looking at the house of the family of Antonia Rädler, the holy woman who began the shrine of Wigratzbad. It is actually where the first grotto was built. It is next to the chapel built by Antonia. She even drafted the blueprints herself for the chapel. Much needs to be done in that district especially regarding our relationship with German bishops. Elsewhere in the world. In Europe; we are progressing eastward. We have just begun a new apostolate in the Czech Republic in the diocese of Litomerice, in the town of Teplice in Bohemia, near the border of eastern Germany. This country is quite dechristianized so it is more a missionary activity than taking over a well established parish. In Africa, we have been invited into a new diocese, this time in French-speaking Africa. One of our priests will begin shortly in the diocese of Natitingou in northern Benin. The young bishop of that diocese used to be an altar boy for a French missionary who was saying the old Latin Mass until he returned to France. The bishop loves the old Mass and would like the traditional Mass to come back into his diocese. He has invited us into his diocese with one condition that we never abandon our specificity, that we keep on with what we are doing. He wants us eventually to have a personal parish there. Of course, it takes time to have one as in Africa you have to build from the ground up, there is nothing there. Our priest will also teach in the local minor seminary and will help in the formation of catechists. There is one continent for which we have not done much so far, it is South America. I was there last summer and I can tell you that there are three bishops who have invited us into their diocese; in Columbia, in Bolivia and in Chile. I do not know when we will be able to send someone there. We do have a few priests from South America and provided that they are willing to go back to their own country or continent we will be able to build apostolates there. We will probably be starting with Columbia as it seems to be the most urgent. It may well be in the city of Bogota, a city of eleven million people. People have been moving into Bogota because of the guerrillas and the lack of safety elsewhere in Columbia. Farmers have been obliged to flee their land so they can be safe in the city. The population in the city is exploding. Unfortunately, the city is limited by the surrounding mountains and the plain between the city and the mountains is already full so building work is going on in the mountains themselves. The bishop we talked to when we were there said his main problem is that many Catholics are deceived into going to Protestant cults and sects. Some people claim to be Catholic clergy such as a former seminarian who proclaimed himself not only a priest but a bishop although he was never ordained as a priest. Problems over there are quite different from those in Europe or Northern America! Father Devillers was given warm and generous applause from the delegates for his very informative and encouraging talk. He was asked whether there were any developments in Asia but he said that at the moment they cannot be everywhere. He has many contacts with the Philippines and Singapore but he does not have a priest to send. He said that the Fraternity does have a priest from Singapore who is currently stationed in Australia and he will be doing a trip to Singapore and the Philippines next summer but they don’t have the resources at the time being. Fra Freddy thanked Father Devillers and said it was encouraging to hear about a society that is expanding but has difficulties in expanding because it is short of priests. What a difference to our own bishoprics where we see so often the stories of no students in the seminaries, no students ordained to the priesthood and so on. We must all pray for our Fraternities and Societies and the work they do.